This week it’s all about the ‘dizzy’ patient, or that patient with vertigo. I recently spoke at EMCORE Melbourne and went through my step by step approach of sorting, in my mind at least, the potential causes of the ‘dizzy’ patient. Below is a summary of those points and a short podcast that goes over all the issues. The miss rate, of patients returning to the Emergency Department, with a diagnosis of stroke, in the first month after discharge, is about 1:500 (Annals Of Emergency Medicine. Vol 57, Issue 1, pp34-41 2011). When the only complaint is Solitary Vertigo, the misdiagnosis rate is only 0.67% (Stroke 2006, 37:2484-2487) That is a vast improvement and shows that when we get down to solitary vertigo, the diagnosis is easier to make. We need to remember that 50% of causes of dizziness are medical ie., new medications, arrhythmias GIT bleeds etc., so we need to look for these. Beware Depending on the CT brain. A CT brain has a yield of < 2%, in patients presenting with vertigo. We should not be using it to clear patients. The reassurance it gives is false, evidenced by the fact that twice the number of patients that returned to hospital with a diagnosis of stroke, had been investigated with a CT brain and cleared before discharge. Perform a neurological examination, looking for specifics. A patient with any neurology (except a positive Rhomberg), means a Neurology referral. Dizziness or vertigo must be present to be able to test for nystagmus. Vertigo and NO nystagmus is of central cause until proven otherwise. Any nystagmus other than simple unilateral horizontal nystagmus, is assumed to be of central origin ie., it is bi-directional, vertical, pendular, see-saw, etc. Cover and uncover each eye in turn, whilst asking the patient to look straight ahead. If there is any vertical correction of the eye, when uncovered, it is a positive test and of central cause. Test Cranial nerves III, IV, VI: Is there diplopia? Test GAIT: Stand the patient. Those patients with a central lesion, have difficulty walking. Those with a peripheral lesion may be able to mobilise by holding onto furniture etc. Whilst the patient begins to sit up in bed look for TRUNCAL ATAXIA. Patients that have this, have great difficulty sitting up. It is of a central cause. If the vestibular nerve is affected, the patient may have an unsteady gait. This is usually a broad-based gait. If the facial nerve is affected there may be facial paresis. The precipitants of vertigo are similar to those of migraines. The history is very important here. If the history is brief, sudden and positional, then think of Benign Paroxysmal Positional Vertigo(BPPV). The symptoms are of short duration and tend to occur when the patient moves their head. Keep in mind that cerebellar or brainstem causes that are vascular in origin, may also have a sudden onset. The Dix Hallpike manoeuvre assists us in diagnosing a peripheral cause of vertigo. It should probably be done following the examination of gait, so that the person is not too distressed to perform gait. There should be direct visualisation of eye movements. Frenzel lenses can be used to assist. If the test is positive, ie., it is reproducible on one side and there is delay of onset of nystagmus and the nystagmus itself decays after a short period, the diagnosis of BPPV can be made. The manoeuvre tests the posterior semicircular canals, which are affected in about 85% of cases. If this is negative consider performing the ‘Supine Roll Test’ described below. Sit the patient up, such that when they lie down, the patient’s shoulders will be level with the end of the bed and their head can lie below the bed. Turn their head 45 degrees towards the suspected affected side. This is usually the side opposite to the nystagmus. Ask the patient to look directly in front. Support the patients head and neck and rapidly bring the head down, so that it hangs 15-20 degrees below the horizontal. There should be a delay until the onset of nystagmus. If nystagmus occurs, the patient should be kept in this position for up to 2 minutes. Look for nystagmus decay. If there is no decay, the cause of the nystagmus may be central. If nystagmus does occur, repeat the procedure to reproduce the nystagmus after the patient has settled. If there is no nystagmus, carefully and slowly sit the patient back up and prepare to test the opposite side. If the Dix-Hallpike is negative, perform a Supine Roll Test. This tests the horizontal canals, which are responsible for about 10% of cases of Benign Paroxysmal Positional Vertigo. The head is simply turned from side to side whilst the patient is lying in bed and we note the presence or absence of vertigo and nystagmus. The presence of vertigo, with no nystagmus, is of central origin, unless proven otherwise. Perform the Head Impulse test. This test has been covered before on this blog. It tests the Vestibulo-Ocular Reflex(VOR). Usually the nystagmus occurs, on the opposite side to which the VOR is affected. When the test is positive, it indicates a peripheral lesion. Ask the patient to look straight at your nose. Explain to them, that you will move their head from side to side, however they should continue to look straight ahead at your nose. When the head is turned towards the side of the affected VOR, the eyes start to move with the head, for a brief instant. Then there is a rapid saccadic correction back towards the centre. This is a positive test, as shown in the video below and indicates a peripheral lesion. Is there any hearing loss? If so assess the possibility of Meniere’s Disease, however be suspicious of an acoustic schwannoma. If there is any headache, except what might be a migraine-related headache, this is a neurological referral. 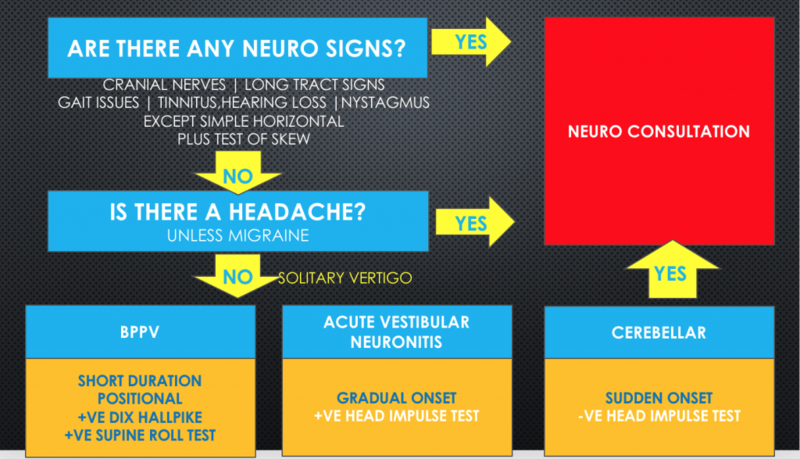 If there is vertigo and nystagmus and a positive head impulse test, this is of peripheral cause. Isn’t 0.67% a miss rate of 1:149?